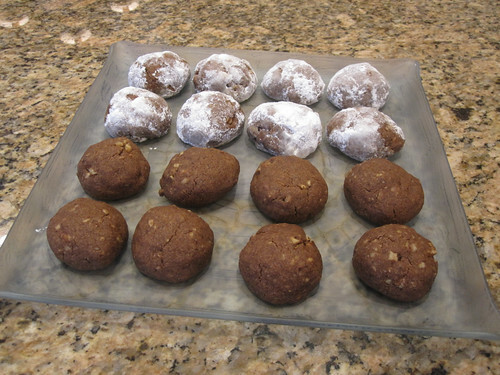 Cocoa, coffee and pecans are rolled together in these semisweet, sugar-dusted cookies. Anyone who is a chocolate and espresso fan is sure to love these! In a large bowl, mix the butter, sugar and vanilla until smooth. Stir in the flour, cocoa, espresso powder and salt until thoroughly blended. Stir in the pecans. Cover the dough and refrigerate for 1 hour. Preheat the oven to 325°. Lightly butter or use parchment paper on 2 cookie sheets. Working in batches, roll the dough into tablespoon-size balls and place about 2 inches apart on the prepared cookie sheets. Bake in the upper and lower thirds of the oven for 15 minutes, until the tops are dry and the cookies are slightly firm to the touch. Let the cookies cool on the sheets for 10 minutes, then transfer to a rack to cool completely; roll in confectioners’ sugar to coat, I prefer these cookies without the confection sugar.